An ancient evil stirs in the black lands of Mordor, and the people of Middle-earth speak of a terrible doom approaching from the east. Another ‘Living Card Game’ from Fantasy Flight, this one based on The Lord of The Rings books, but with an original and interesting emphasis on cooperative and solo play. 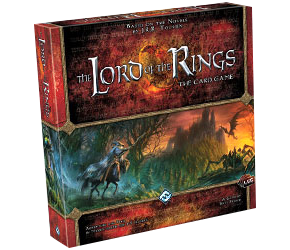 The exciting twist in this game is that it is a co-operative card game that allows 1-2 players (or up to 4 with 2 Core Sets) to select heroes, gather allies, acquire artifacts, and coordinate their efforts to face Middle-earth’s most dangerous adversaries. By building a party from a set of 12 hero cards, players can focus their decks on any combination of four ‘spheres of influence’: Leadership, Lore, Spirit, and Tactics. Then cooperate to overcome the obstacles drawn from the encounter deck, complete the quest, and claim victory.